"It passed a line that we should not allow American political organizations to pass." 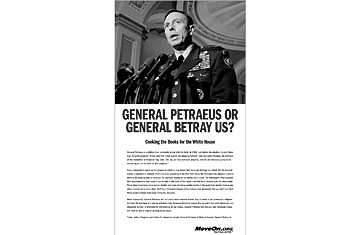 Giuliani, blasting MoveOn.org's "General Betray Us" ad. The statement troubled many First Amendment defenders, but a campaign spokesperson later said: "The Mayor was referring to the fact that Democrats stood silent on an ad that crossed the line in disparaging an American hero."